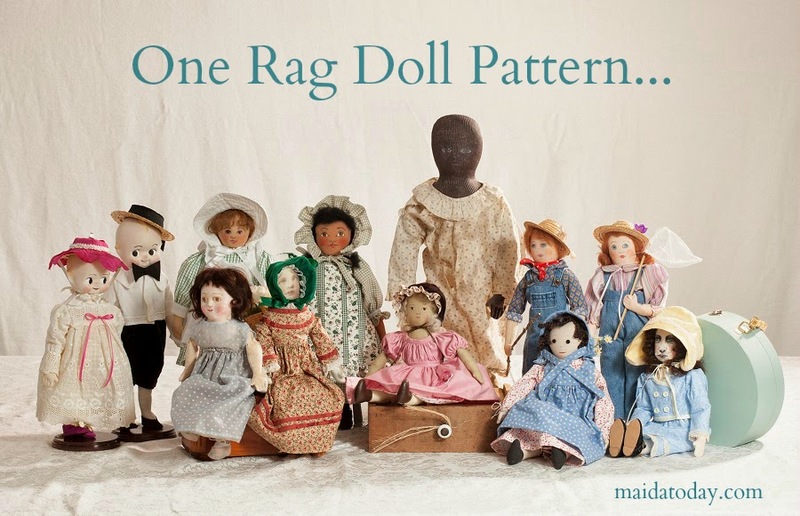 Many times dolls were made in the same mold for either a china finish or a bisque, often parian untinted bisque. Sometimes too, we see the same mold used for china and mache. Such is the case for this one. 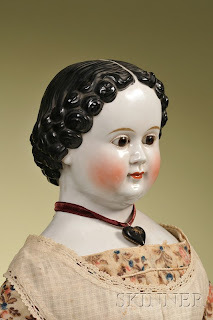 Several examples of huge china heads in this mold are in Art of Dolls by Merrill. Pictured in a chair is a huge doll, with an 11 inch tall shoulder head. 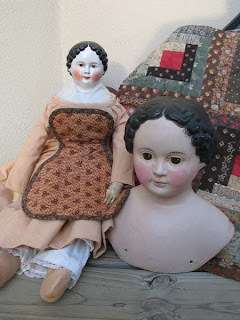 This mold always has a sleepy eye on the doll's left eye. This mache head in this size was in Gerkin's book on maches. It is owned in a blond version by the Shelburne museum. It has been found and documented in one of the doll books as having a Superior label from Muller and Strausberger. 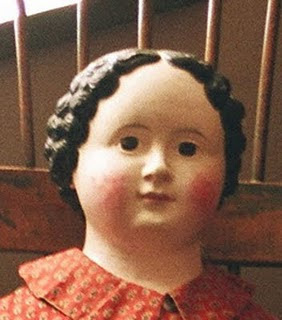 This doll I called "Abby" has gone to live with Rachael K. The little dashes under the eyes, so typical of M and S superiors further confirm her origin. 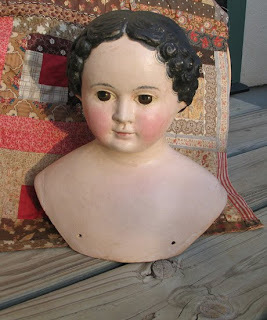 I now own lovely little "Hannah" a 9 1/2 to 10 inch tall mache shoulder head which I plan to sew a new body for. Her good old cloth hands are still intact and will stay with her. Can you see the same sleepy left eye? 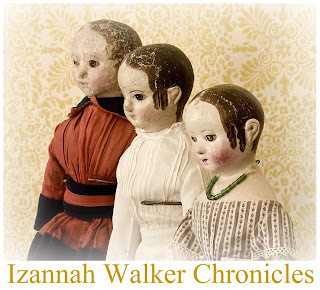 It is also on the painted eye china head doll beside Hannah in one picture. A doll of this mold is in the Richard Wright auction coming up soon. Now here is the puzzle: The mache heads are documented and beyond a doubt by Muller and Strauseburger. But the china heads are attributed to Kloster Vielsdorf, as stated and pictured on page 125 of Mary Krombholz's new book on chinas. I wish I could ask her and learn more about this mold! In either China or mache they are unusual finds. I love the faces of these! They are so simple but seem to speak to my very soul.